I’m a brown bag kind of guy. Why spend $8 on a sandwich from a chi-chi foo-foo fancy deli every day in downtown Burlington when I can just bring the fixings for my own sandwiches to work? 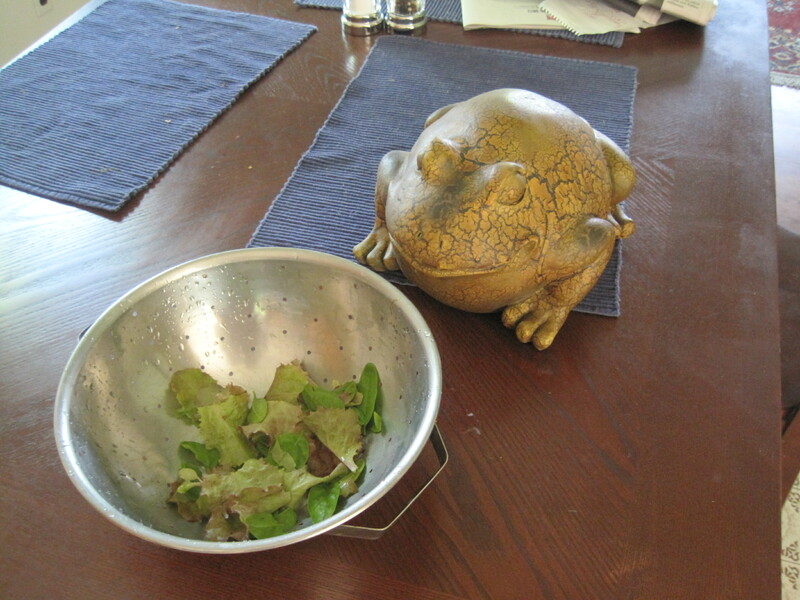 Darlusz Zabagaiski, my Polish household frog, inspects the garden greens I picked for my lunchtime sandwiches. The problem with that is, my sandwiches are definitely more dull than the elaborate ones a lot of lunch places make. That’s another reason why I like this time of year so much. My summer morning routine includes going down to the garden, picking some red lettuce and some baby spinach leaves to add to my sandwiches. That’s not the only thing I do with the greens of course. They contribute to some very nice salads. But it is such a delight to bite into a turkey sandwich and taste the fresh greens from the garden. This entry was posted on July 1, 2010 at 10:05 am and is filed under Uncategorized. You can follow any responses to this entry through the RSS 2.0 feed. You can leave a response, or trackback from your own site.